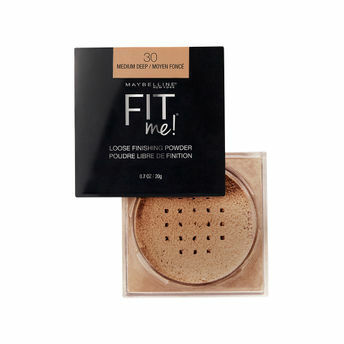 Maybelline New York Fit Me Loose Finishing Powder is a mineral-based formula designed to help control shine and smooth skin's texture with a hint of color. This mineral powder provides the perfect finishing touch to your makeup base. Start Fit. Finish strong. Now Fit happens from start to finish! This loose setting powder is available in a collection of shades to fit any skin tone. Apply with a brush. Swirl brush into powder, tap excess and lightly dust over face. Can be used alone or on top of makeup. Explore the entire range of Loose Powder available on Nykaa. Shop more Maybelline New York products here.You can browse through the complete world of Maybelline New York Loose Powder .Alternatively, you can also find many more products from the Maybelline New York Fit me Loose Finishing Powder range.